In college I took an early childhood education class for one reason: I knew nothing about kids. Sure, I’d been a kid. Sure, I knew some kids. But I never raised kids. And, I thought one day I might! Taking that class educated me about child development and equipped me with some great skills for becoming a parent. Of course, I learned a lot on the job, too! Luckily, you do not have to reverse time and take a college course to gain some parenting prowess. That’s because Nina Garcia, blogger extraordinaire of Sleeping Should Be Easy, has published Parenting with Purpose. I read Parenting with Purpose and nodded in agreement with the helpful advice. What I appreciate most is Nina’s practical style. She admits she is not a Professor in Child Development; nope, she’s a mom who found some things that worked for her and might work for you. Establish routines and stick to them. Speak respectfully to your kids. Model the behavior you expect through your words and actions. Recognize that discipline is teaching and helping our kids to behave. Consider the child’s point of view. Consider what is your end goal for disciplining your child. Ask why. It helps you respond, not react. Remember to connect with your child. Nina finishes the book by including 20 Actionable Items You Can Do. I **so** appreciate when authors talk about what to do, but then include HOW you can do that! 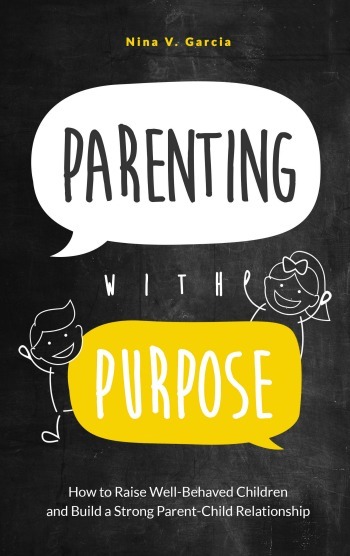 Parenting with Purpose is available for FREE on Amazon through October 22! Woo hoo! You can also join the Parenting with Purpose community and sign up for the newsletter here. What has been the best parenting advice you ever received? What tip or trick do you like to pass along? I loved this book too1 So excited for Nina! Yes! Her journey as a writer is inspiring to me! This sounds like a great book, Katy. Love the “ask why.” I always remember my daughter’s kindergarten teacher mentioning that it is so stressful for the littlies to go to kindergarten. A lot is expected of them there. As a result they could need to vent and act up when they get home. That little bit of a heads up really helped me. It was easy to dismiss the kindergarten hours as “sand and water play” and she got me thinking about it more seriously. Now that our province has all day kindergarten I can only imagine the potential for havoc. Kelly L McKenzie recently posted…Do Quirk Magnets Attract? I loved this book! I really needed her reminders that parenting is not meant to be a battle between you and your kids! Rabia @TheLiebers recently posted…Can We Have a Conversation About Guns? I saw Tamara’s review on this book as well, and I’m so excited to learn of such a great book and a new blogger to get to know!! I love books that are straight forward and helpful for moms who really need guidance and direction when they are starting out in this motherhood journey! Useful information is SO important and it seems Nina has a great deal of wisdom in parenting effectively. We could all use the help! My tip and trick? Let IT GO. When kids are stuck in a phase or a difficult stage and you start to worry they will never get out of it- meet them right there in the place they are… and it will always transform at some time into the next stage or phase. I stopped worrying when I finally realized this. It makes for a more peaceful parenting life, that’s for sure! Every kid ages and changes uniquely on their own. Don’t compare!